A cop's son is kidnapped as a result of his crooked dealings. 2011's French thriller Sleepless Night was a minor breakout hit, finding an audience on VOD among action fans bored of the uninspired offerings of Hollywood in their favourite genre. Director Fredric Jardin's film could have used a stronger script, as it was badly lacking in the character department, but it boasted acres of style, and many commentators expected its director to make a move to American genre filmmaking. Surprisingly, Jardin hasn't worked since, but his film has now been given the Hollywood remake treatment with Swiss filmmaker Baran bo Odar at the helm. This version stars Jamie Foxx as Vincent Downs, an undercover detective seeking to bring down corrupt cops working within the Vegas Police Department. When his work leads him to steal 25 kilos of cocaine from casino owner Stanley Rubino (Dermot Mulroney) to maintain his cover, his son is kidnapped by the latter. Downs heads to Rubino's casino to retrieve his kid, but matters are complicated by the presence of a violent local gangster (Scoot McNairy) and a pair of Internal Affairs detectives (Michelle Monaghan and David Harbour) who mistakenly believe Downs is himself a crooked cop. There's always something thrilling about the idea of an action movie set in a limited location. Arguably the most revered of all action flicks, Die Hard is the perfect example of how cinematic this concept can be. With Sleepless, Odar fails to exploit this conceit, making little use of his geographically restricted setting. In fact he really does nothing with the concept. Unlike its slick French counterpart, Odar's remake is a visually bland movie that resembles an episode of TV's 24 at best. One of the highlights of Jardin's movie was a They Live inspired kitchen brawl between its pudgy anti-hero and an equally out of shape heavy, staged with a thrilling realism. In Odar's version he pits the muscular Foxx against a supporting actor built like a professional wrestler, but despite such athletic participants, his fight is a lot less exciting, all quick cuts and shaky cam designed to produce the illusion of excitement. It doesn't! 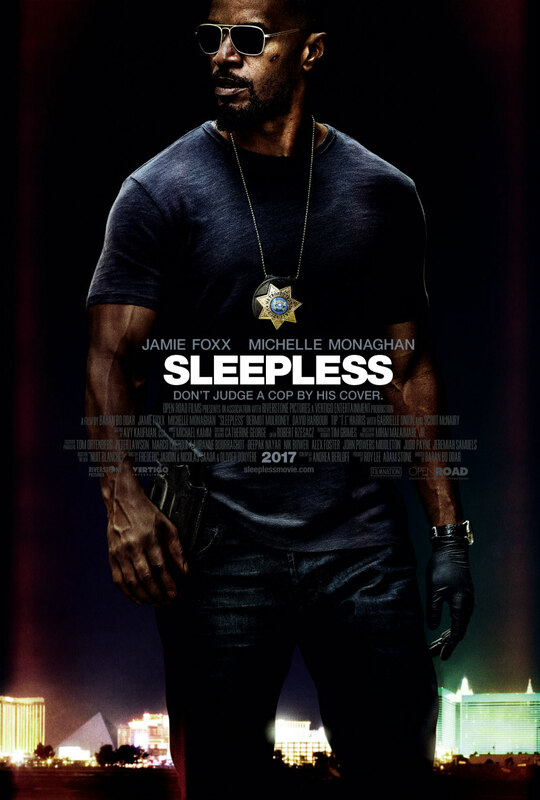 Perhaps what was most interesting about Sleepless Night however was how it never asked us to like its protagonist, a crooked cop, but rather empathise with his situation. This remake erases such cloudy morality by reworking the character as an undercover cop who is working on the level. Bafflingly, most of the film plays out as though it believes Downs is crooked, and wants the audience to question his motivations, despite revealing to us in the movie's second scene that he's actually working undercover. With some script adjustments to clear up such confusing details, and a more innovative director at the helm (Jardin would do for a start), Sleepless could have been an electrifying piece of action cinema in the mould of John Wick. As it is, it's a lazy adaptation that fails to elicit even the most minor of visceral thrills. Sleepless is in UK/ROI cinemas May 5th.